Italian designers Luigi Micciché and Teodora Soldatiìs vintage button creations came about by chance, in Sicilian-born Micciché own words "we don't know if we are feathers, carried by chance, by the wind or whether our journey is a destiny already written"... "at any rate one mid-summer Roman night we found ourselves playing with buttons and from this game a craft was born, like those of days gone by." 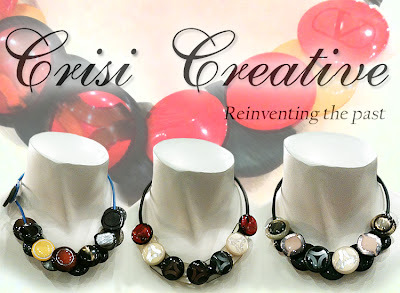 "Crisi Creative" their Rome-based company hopes to shed some light on a very dark period most of the world is going through - crisis - economic, cultural, social and also creative. By bringing back these small objects lost and forgotten, weaving them into funky, sophistaced pieces of art to be worn and cherished they are taking an important step toward hope, values and reinventing the past. These creations have to be touched and worn to appreciate the quality and thought that brought them to life - each piece is unique, hand-made, solidly constructed of recycled materials and reversible or double-face, easily transformed into another creation by flipping the buttons over... mother-of-pearl becomes tortoise shell, autumn color story slips into a Meditteranean theme... buttons from around the world and from all times past and present. Each one-of-a-kind necklace has its own story to tell.